The L300 preamplifier has additional features to the L200 model and offers the ultimate performance match for the new to market HX100 power amplifier. 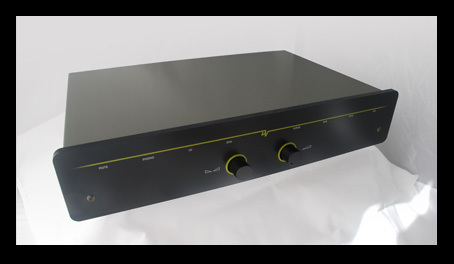 The L300 is a 2-channel line level preamplifier with an optional Phono input. It features unique, ultra-linear, amplifier stages that automatically adapt to the volume level to maximise linearity and minimise noise and distortion. With no mechanical parts in the signal chain, problems associated with switches, pots and relays are eliminated. The L300’s electronic switches cannot wear out, corrode or change. They do not generate electrical noise, are unaffected by vibration and operate silently. The electronic volume control offers precise channel matching over the whole volume range. Detailed specifications for the L300 preamplifier will be posted here shortly.